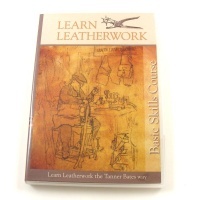 This is our most extensive leather craft tool kit, containing a carefully chosen range of tools and supplies for making and mending in leather. 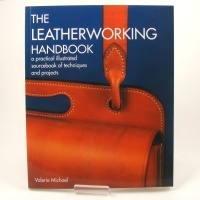 It contains many items in common with our smaller kits, but also includes more specialist tools such as a full range of stitch hole punches and premium quality items like a rawhide mallet and a large 30x45cm cutting board. Square Ruler 8" x 12"
Clicker Knife Blades - 1 x Straight, 1 x Curved. 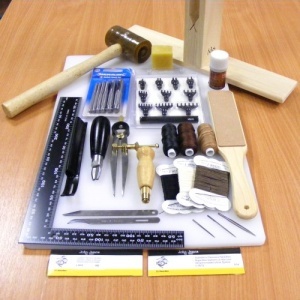 * Sharpening Strop & Jewellers Rouge - N.B: The Sharpening Strop and Rouge are currently unavailable, so the price of this kit has been reduced by £16.25 to reflect this. Usual kit price is £219. 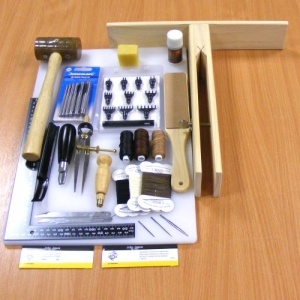 If the contents of this kit aren't quite right for your needs, you can always use it as a starting point, to choose your own selection.